2018 was a very exciting year for us. We shot some of the most amazing weddings, made new friends and travelled the world. We arrived on Wednesday and started with the Mehendi ceremony at the bridal suite. The next morning was the Haldi ceremony on the beach. This was one of the funnest parts. I don’t think Priyanka and Ushan liked it, but the family definitely enjoyed the process. Right after the Haldi, the couple rain straight into the ocean for a few photos. Next was the Sangeet. Or I should say - next was rain. A real tropical rain. At some point I thought Sangeet was not going to happen. But eventually it stopped and everything went as planned. Huge shoutout to DJ Yogi who kept the party going through the rain. Next day was the traditional wedding ceremony followed by the Sri Lankan wedding ceremony. The Hindu ceremony took place on a see through platform over a pool, while the Sri Lankan ceremony took place on the beach. The weekend ended with a reception, fireworks, dancing, performances and speeches. It was an unforgettable weekend filled with lots of fun and dancing and could not thank Priyanka and Ushan enough for flying us to DR and document their wedding. 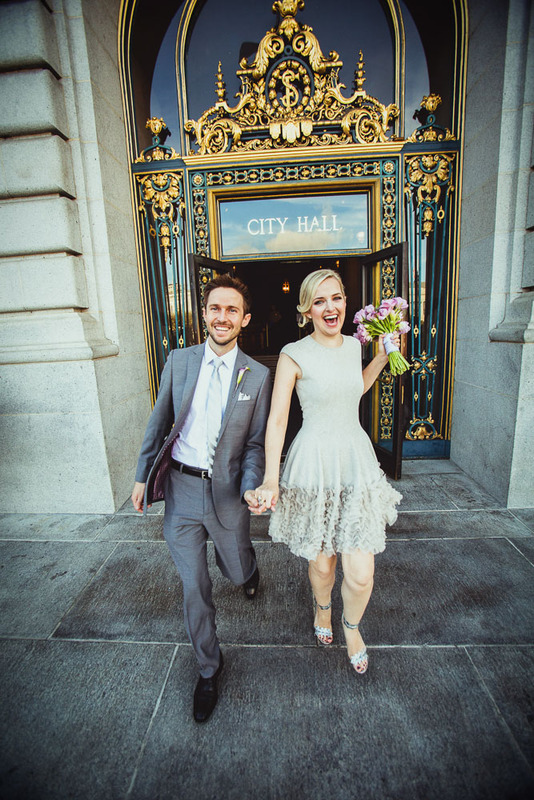 City Hall elopement or a full day wedding? I received this in an email a few days ago, and it got me thinking about venue trends. More and more, couples are deciding to elope or have smaller weddings. 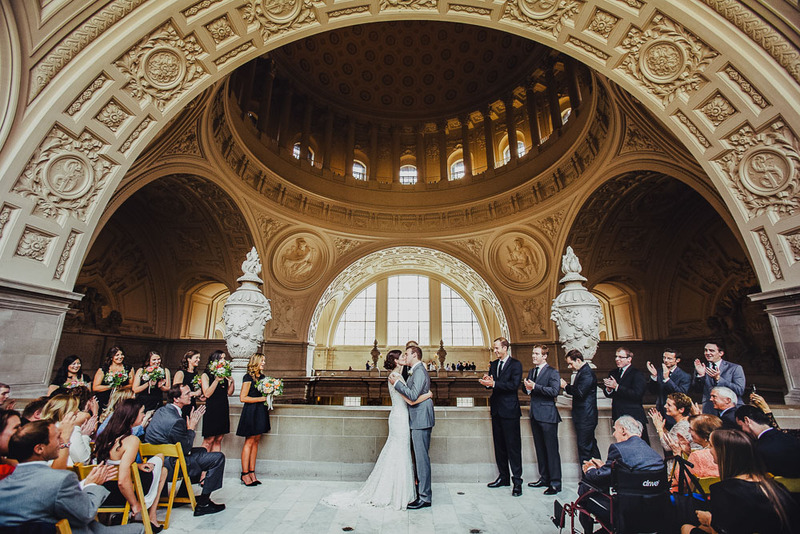 If you’ve ever visited San Francisco’s City Hall, you must have noticed at least a few wedding ceremonies. It’s becoming the ideal place for couples to tie the knot. City hall weddings aren’t just for young star-crossed lovers evading their parents disapproval anymore. Nowadays it takes all kinds! I grabbed this photo during a wedding today. The three windows on the third floor are really popular spots for photos, as you can see from the couples framed in them. The light is soft, a wedding photographer’s dream and the easiest way to complement the couple’s wedding-day glow. Every single day, dozens of couples get married at City Hall. We have filmed and photographed couples that came all the way from Taiwan, UK, Australia, Ukraine, etc. You name it. Today’s couple traveled from Sacramento. 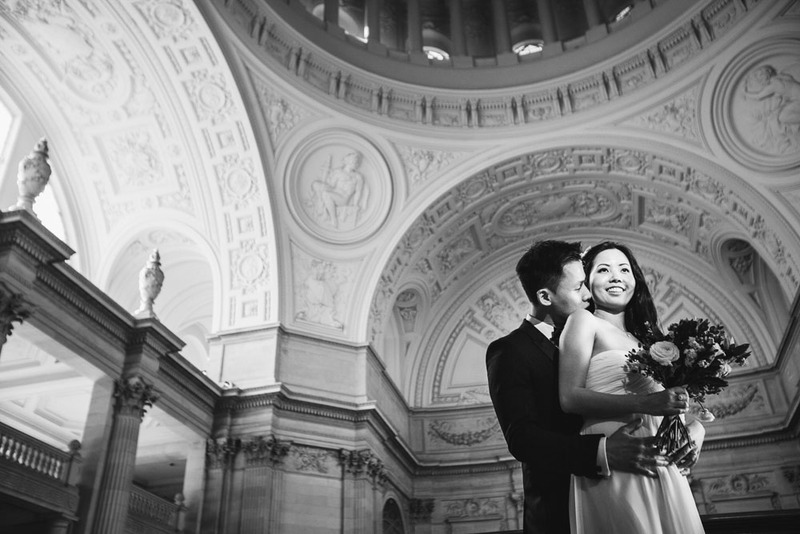 City Hall has become a destination, one of the most desired wedding venues in SF. 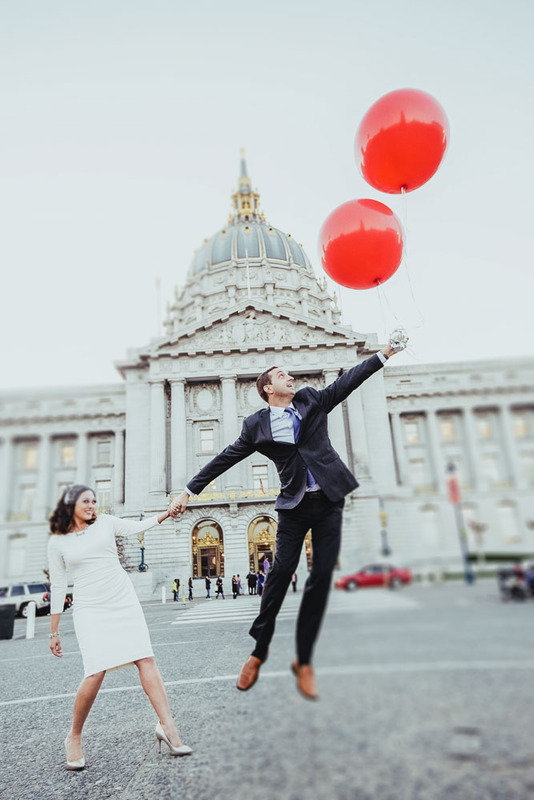 Recently, another couple reached out to us that had planned an elopement at City Hall a year in advance. This is pretty unique. For the most part, our couples reserve us between 3 weeks and 6 months before their wedding. 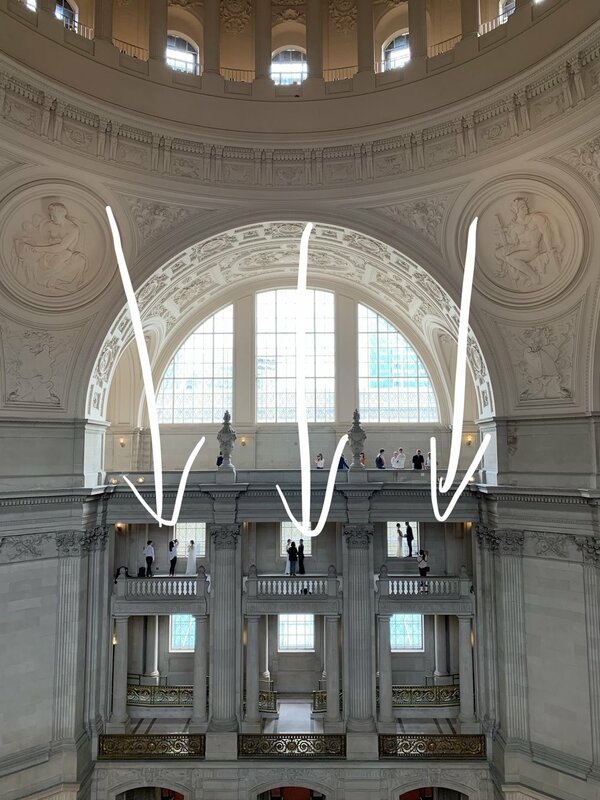 This confirms just how popular City Hall weddings become. So why do couples increasingly choose City Hall over other destinations? Most obviously, it’s the cost. 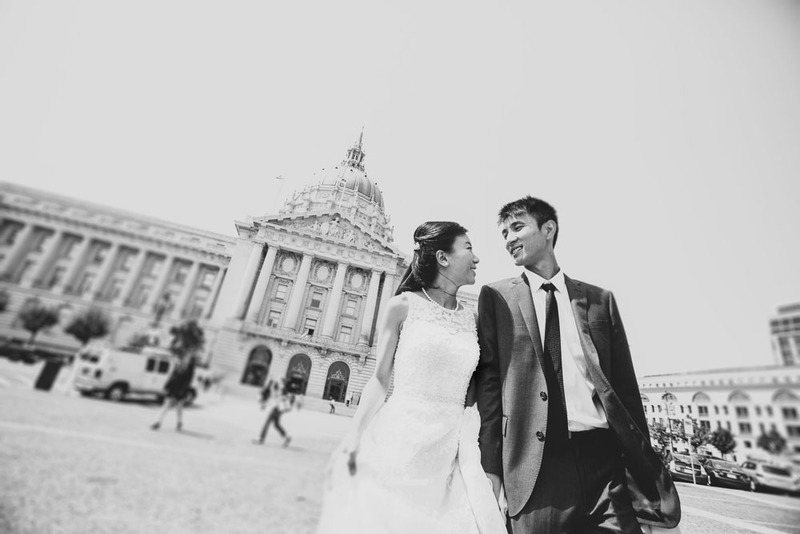 Compared to a full-day wedding, eloping in City Hall will cost you much less. The venue isn’t going to deplete your savings account. You can opt for a more special, private celebration by renting out one of the 4th floor galleries or the Mayor’s Balcony for about $1000. Still, you aren’t going to have 120 mouths to feed, DJs to pay, or those pesky paper invites to over-order just in case. Saving money on these things allows you to spend a little more on talented photographers or cinematographers. City Hall weddings take place during the week, which means hiring someone to document your day will cost you less than reserving someone for the weekend. We know at least a few couples that specifically changed their wedding venue to City Hall in order to afford us. 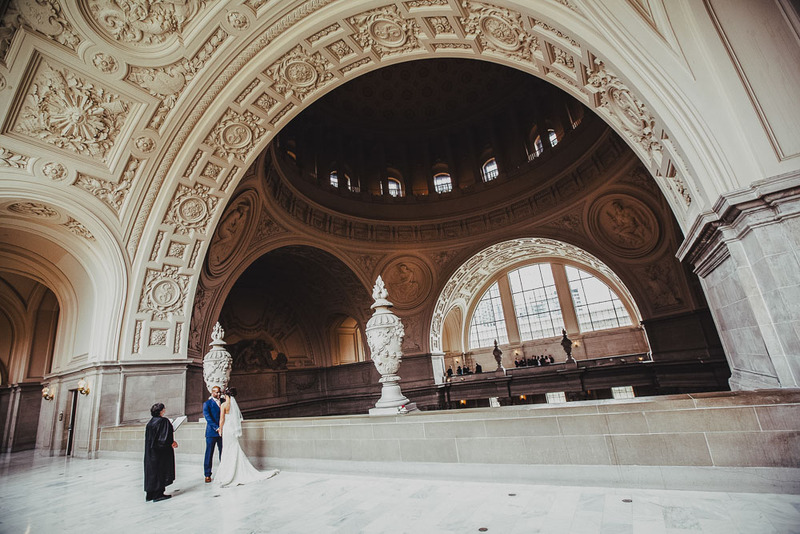 The almost oxymoronic combination of the beauty and convenience of marrying at City Hall is another main reason for choosing it as your venue. Undeniably, it’s one of the most gorgeous buildings in SF. On top of it being totally photogenic, it’s also surprisingly convenient. All you need is an appointment, and you will be provided with a marriage commissioner who will officiate your ceremony. Pretty simple and (almost) hassle free. Being a government building in the city, transportation to and from is easier for everyone than traveling to a middle-of-nowhere farm or hopping from church to reception venue to hotel, etc. You are only allowed 6 guests if you don’t reserve a room, but making your and their day run smoothly gives you more room to truly enjoy yourself. 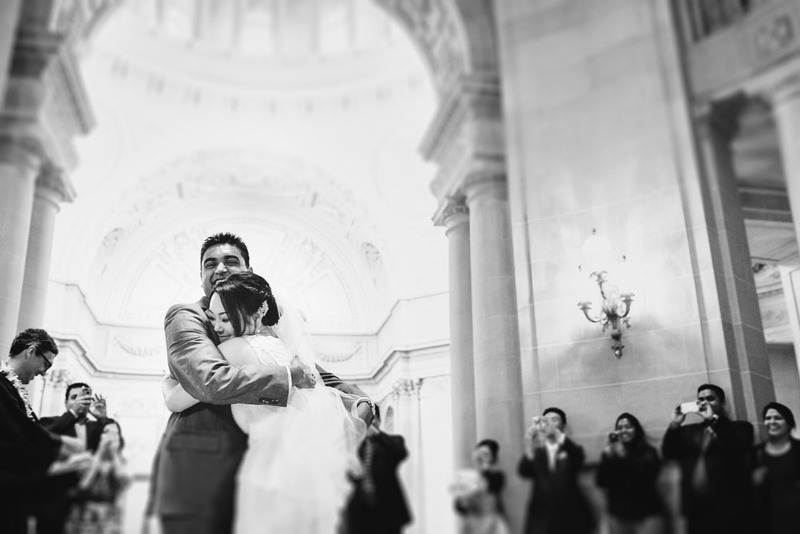 I’ve already written about how to get married in City Hall along with some useful tips, so feel free to check that out, or watch some of our city hall wedding films, or even follow our city hall blog for the most recent weddings. There are many places to choose from in SF - Japanese Tea Garden, Golden Gate Park, Presidio, the list goes on. But, no matter the weather, despite the wind, rain and fog, City Hall will always provide a roof (a quite high one with plenty of airy, beautiful, photo-friendly space below!) so that your guests don’t have to shiver or melt during your ceremony. If you’re planning a City Hall wedding and are interested in our cinematography or photography, feel free to fill out this form and we will get back to you within a few hours. If you planning a city hall wedding and interested in our cinematography or photography, feel free to fill out this form and we will get back to you within a few hours. An beautiful story that started online, and after the very first date, Anya knew Kevin was the one. Beyond excited to share this epic two day Indian wedding we filmed two weeks ago. A few weeks ago we were lucky enough to film a gorgeous wedding at one of our favorite venues - Villa Montalvo in Saratoga. As you probably noticed from our films, storytelling is what drives us. We use speeches, vows or letters as the core of our movies, and this wedding was no different. We used Mark’s brother speech because not only it was pretty hilarious but gave some insight into the couple’s relationship.